Sterilizes & Disinfects the Air You Breathe With HEPA, UV & Ionic TechnologiesSterilizes & Disinfects the Air You Breathe!Sterilizes & Disinfects the Air! Use the same sanitizing technology found in hospitals to stop viruses and bacteria dead in their tracks with the Summit air purifier! Featuring advanced seven (7) stage filtration, The Summit efficiently filters airborne pathogens from the air while utilizing Ultra-Violet (UV) and Ion technology to kill germs year-round. 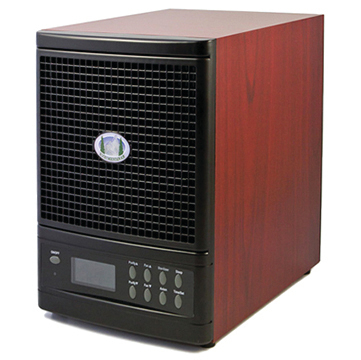 In fact, Germicidal air purifiers have been effectively utilized by medical professionals for years to prevent the spread of diseases and sickness. Now that same hospital-grade protection is available for your home or office. By disinfecting the air you breathe, the Summit can keep your home safe from the spread of sickness (cold, flu, hay fever, etc...) in up to 3,500 square feet of your home. Additionally, each air cleaner can be set to run while you are gone, ensuring the air in your home is fresh and clean upon your return. So get the Summit air purifier today to reduce your exposure airborne to sickness while making the air in your home Rocky Mountain Pure! The Summit air purifier for germs and bacteria combine seven powerful stages of air purification to help stop the spread of germs, bacteria, and viruses. By allowing you to bring the same technology hospitals have been using for years into your home, the Summit is able to provide you with protection and peace of mind. Seven Stages Of Purification: Ionic Particle FiltrationAir purifiers by Rocky Mountain Air® play a big role in stopping the spread of viruses and infections by removing contaminants from the air with ionic particle filtration. By utilizing negatively charged ions (Anions), our ionic filters cause airborne particles to become too heavy to circulate through the air when these particles bond with Anions. As a result, the bonded particles become trapped in the ionic filter which drastically reduces the spread of viruses, bacteria, and other allergens. In fact, hospitals routinely use ionic particle filtration to provide a safer environment for their patients.